Last week in Barcelona, while taking part to a beautiful business event organised by my friends Simone Cicero and Albert Canigueral, I was once again asked to talk about horizontal organisations and how they are the upcoming future. Indeed, I truly believe that a great part of our future lies in how we’re evolving our ways of coming together to create value and have impact. So I totally agree that the future of our organisations is intimately linked to the future of work and, way beyond, to the future of our race. The problem with that request is that I honestly don’t think there’s such a thing as a “horizontal” organisation. Now, unless we want to consider an organisation that is metaphorically lying on the floor half-dead so that we could say it is “horizontal”, human systems are much more organically tridimensional than “horizontal” or “flat”. I’m perfectly aware that using that terms implies there is no hierarchy as opposed to the industrial-age hierarchical organisations, but still I think it is a very bad idea to use that metaphor since, as Esther Derby has nicely put it, metaphors affect the way we think, much more than we’re aware of. So here go my considerations about it. 1. We need to stop identifying leadership with positional power. In spite of who is “in charge”, leadership is a basic dynamic of human systems. It is their energy. Things move because of somebody taking the lead and others moving accordingly. It is an important part of how we evolve. If you have an organisational structure that provides power concentrated onto a few people in specific positions, that doesn’t mean you’ll find leadership in that same places. Actually rather the opposite. Leadership arises from people, not from the org chart boxes. And it is always there, distributed among people and changing over time, in spite of the organisational structure. Harrison Owen beautifully states that leadership arises at the intersection between passion and responsibility, two traits of the person that might or might not correspond to the organisational role and position. For this reason a human system is and will always be “hierarchical”, in the sense that in time there will be people leading and others following, whatever the organisational structure. 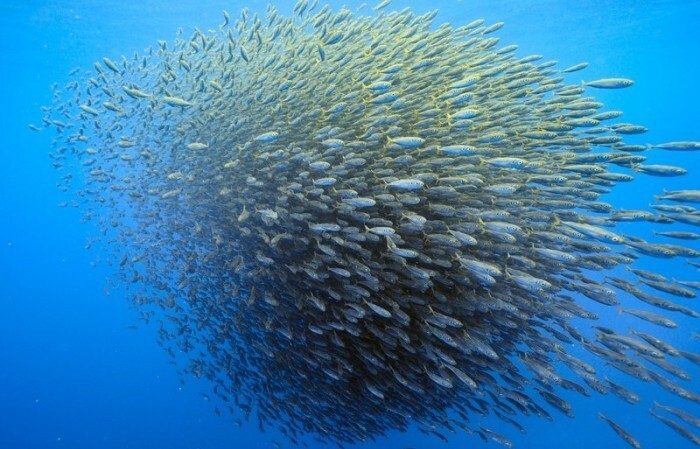 It is a tridimensional system, organically similar to a school of fish in this respect. It is not horizontal or flat, at all. 2. Next generation orgs are adaptive. Now, here lies one of the most compelling revolutions we’re undergoing: we’re designing organisations that allow people to arrange the way they work together in a variable way, according to the needs of the situation and having the formal system adhere to the real one. The real structure, in every given moment, is reflected by the formal structure. And this is key for the maximum expressions of our ancient capability of dealing with complexity and variability as a unique whole. Having the formal structure as a dynamic support instead of a burden in our way. If you think about the org chart as a picture, then we’re now talking about a movie. A continuous flow of frames, each of which is the formal organisation in any given moment following the needs of people in the way they work. Making this possible is what adaptive organisation design is all about. 3. The most important focus is on strategic agility. 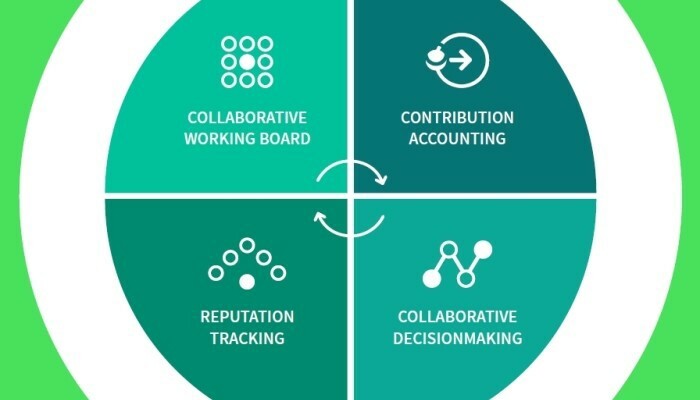 Once we’ve understood that an organisation today can be a tridimensional human system set in motion by passion and responsibility through leadership, and continuously changing shape and dynamics, we’re finally facing the biggest and deepest problem: governance. As my friend Indy Johar beautifully stated “the real challenge is allocating value, it’s a human challenge and it’s about governance”. How should each system define direction, priorities, polarities balance and lines of action? This is the true point. And this is where overtaking the industrial age positional-power dynamics is tougher. Many words pertain this beautiful domain, such as collective intelligence, collaborative decision making, real time strategy, emergence. For each of them, and of many others related, an entire conference could be held diving into the topic for days. This is where I put the focus when I say that the future of our organisations is intimately linked to the future of work and, way beyond, to the future of our race. LiquidO has been designed for this. It is growing with us and many passionate pioneers in the world. Moreover, in the last few years I’ve been lucky enough to work on these topics with amazing people, such as Paul Tolchinsky, Stu Winby and Dawna Jones, just to name a few of the most recent experiences. There is an outstanding body of knowledge today about operational agility. So much that the word “agile” has become a buzzword, and a few days ago I’ve heard Jeff Patton reading a letter of “divorce” he’s addressed to Agile, after “a long and happy relationship”. But at the same time, over and over again I’ve seen the agile operational people crashing against a “traditional” plan-and-control based governance of the organisation. That’s the point now, and it’s where we’re working all around the world: how to put strategic agility in place, to give the needed neuroplasticity to our institutions and face the huge challenges for mankind coming in the next decades. There are more than a few ideas under development, but that’s food for another post!